For this Monday’s update, I decided to post a page from Club Capcom’s Spring 1993 issue. Club Capcom magazine is the predecessor of the CFC-Style Fan Book mini ‘zines that I pulled content from last week. This time, I’m translating a prologue teaser for Rockman 6 that also made a cryptic new announcement regarding the future of the Rockman franchise on the Super Famicom (Super NES) that had many Japanese fans super-excited! 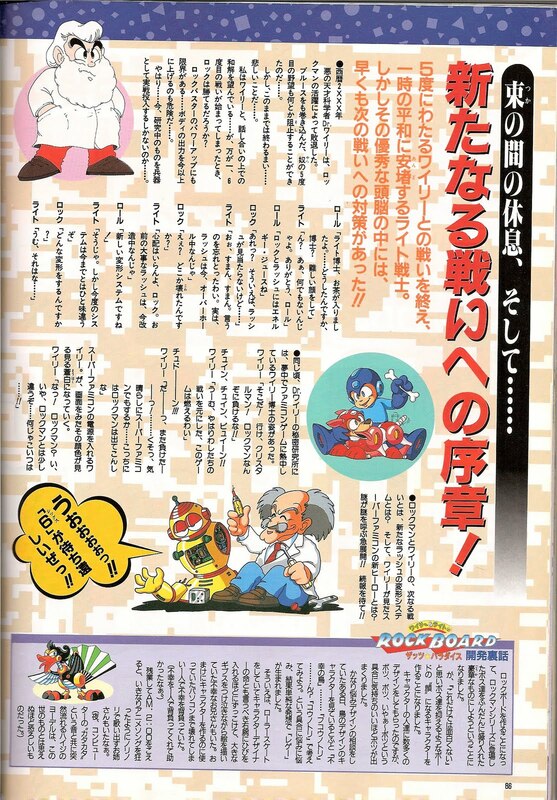 As a bonus, at the bottom of the page there’s an untold story from Rockboard’s development team detailing the birth of Reggae, who recently made a comeback appearance in Rockman 10’s Forte (Bass) mode! Bump it! A Prelude to a New Battle! After the fifth battle with Wily had ended, Dr. Right was able to enjoy a momentary peace. However, within the confines of his brilliant mind, the good doctor was already planning countermeasures for the next conflict!! 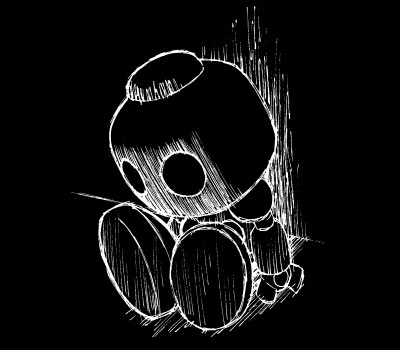 I wish for nothing more than to reconcile with Wily, to talk him out of his misguided ways… But I fear a sixth conflict is inevitable. And when the worst happens, will Rock still be able to come out on top? Dr. Right, I’ve brought you your tea… Is something the matter, Doctor? You’ve got a very serious look on your face. Hmm? Oh, it’s nothing for you to be concerned over. Thank you, Roll. I also brought some energy juice for Rock and Rush! Oh, yes, I’m sorry I forgot to mention this earlier. Actually, Rush is in the middle of a major overhaul right now. Whaaa? You mean he’s lying in pieces somewhere? Don’t you worry, Rock. I know how important Rush is to you. He’s just undergoing a little remodeling, that’s all. I’ll bet it’s for a new transformation system, isn’t it! That’s right. However, this new system will be like nothing you’ve ever seen before! What kind of transformation is it? Meanwhile, in Dr. Wily’s secret laboratory, Dr. Wily was in the middle of a dream where he was engrossed in playing a Famicom video game. That’s it! Go, Crystalman! Rockman will surely be defeated this time! Whew, this game is so close to the real thing, it’s getting me all fired up! Whaa, I lost again?!! ……Drat, maybe I should try a relaxing Super Famicom game instead… At least Rockman won’t be in any of those. Dr. Wily switched on the power of the Super Famicom, and saw something that immediately turned his face very pale. Wha…! Rockman?! No, wait, this guy’s a little different from Rockman….. What is this……!! What will happen in Rockman and Wily’s next battle? What of this new Rush transformation system? And, just who is this new hero of the Super Famicom that Wily saw? These mysteries are building up!! Look forward to our follow-up report!! WOOOOOOOOOOOAH! I can’t wait for “6” to come out!! Wily & Right in Rockboard: That’s Paradise! When we decided to make Rockboard, our plan was to use as many of the amazing bosses that had appeared throughout the Rockman series as we could. But, we also thought “We can’t just use all old characters, or it won’t be as interesting!” So we decided to leave room to create a new character, who would become the fresh “face” of Rockboard. We received a multitude of designs from the character people, but for one reason or another, “Rejected, rejected, ugh!-rejected!” became repeated, over and over. These characters just weren’t what we were looking for. To say we anguished over the design would be an understatement. Until finally one day we were having a meeting and a design for a bird chracter caught my eye, which had been labeled “bird of misfortune/disaster.” In Japanese, that’s “Fukou no tori”… but when I first saw it, I read it as “kounotori” which is an oriental stork! And that’s how after all that worrying and stressing out, we finally arrived at a simple but splendid concept, and “Reggae” was born. The world can be a cruel place, indeed. But, everyone loves a sob story, right? So, Reggae is supposed to be based on one of these? I always thought he was some kind of crow-duck hybrid… I think they pretty clearly took some creative liberties, in any case. 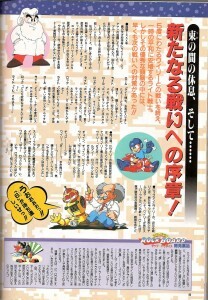 I hope you guys had as much fun reading about this little fragment of forgotten Rockman lore as I did discovering it. There’s plenty more where that came from too, so come back next Monday for another history lesson! See ya then! 3 Comments to "The Lost Episode of Rockman 6"
That certainly was an amusing read. Poor Wily. Though I wonder if what he saw wasn't Super Rockman instead of RockmanX. It certainly seems to be X. Actually, what would be even more hilarious is if Zero himself came to be through such a paradox. Zero dreamed of the X series, and came up with Zero from there. A rare game to own indeed, for being both fun and low in print. It’s so exivespne, that I would suggest getting the Mega Man Anniversary Collection with 8 mega man games on it for one of the last gen consoles. At least that way you get his old-school, awkward jump sprite.